I grew up watching Don Mattingly play first base for the Yankees when he and Dave Winfield were pretty much the only guys worth watching. Day in and day out “Donny Baseball” came to play. There was a laundry list of things he could have complained about, but he never did. And when fate dealt him a bad back that cut short what would have been a Hall of Fame career, he didn’t cry about it. In those years where he went out onto the field and everything hurt, he was a grinder. Don Mattingly was the only Yankee I never saw booed at Yankee Stadium because he was class personified. It’s good to see that the 2013 Yankee crew continues to use the “no excuses” template. It’s serving them well. It has become almost impossible to root against the Yankees. Yes, the New York Yankees. Maybe that’s a stretch. Certainly, the Red Sox and Orioles don’t feel that way. 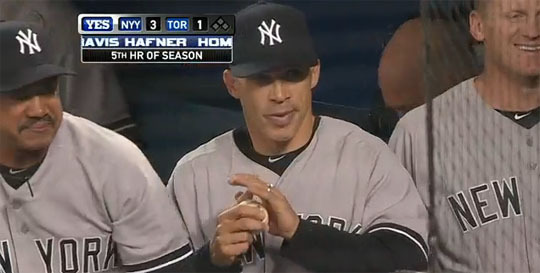 On the other hand, even they have to admire how the Yankees have handled their amazing run of injuries. No team in baseball has been hit harder. Even worse is that there’s no certainty when the Yankees will be whole again. Curtis Granderson should return next month, but Derek Jeter, Alex Rodriguez and Mark Teixeira are out indefinitely. So many players have gone down that losing Ivan Nova and Francisco Cervelli during a victory over the Blue Jays on Friday night doesn’t even seem like a big deal. Hey, what’s two more? As if the challenge could be any greater. As if anyone is going to extend the Yankees any sympathy anyway. Through it all — and this is where the admiration part comes into play — the Yankees have never uttered a complaint about their lot in life. Certainly not Brian Cashman or Joe Girardi — in fact, they’ve been absolutely consistent that expectations remain the same as always. That is, if the Yankees don’t end up holding the World Series trophy, this season will be a failure. They’re not just saying it, either. They absolutely believe it. There’s a collective confidence — or ego or whatever you call it — among a group of players who’ve won as much as the Yankees have. They believe they’re going to win no matter what. Players come and players go, but the group’s core confidence is unshakeable. New Yankees buy in. Success breeds success. Nothing scares people more than a man who truly believes in himself. The man who does not entertain the thought of failure and who is not bothered by setbacks scares his peers because that’s not how it’s supposed to work. The man who expects success thinks and behaves in ways that are worlds apart from the man who dwells on failure. When I was a kid I’d sometimes complain that what my dad said or did wasn’t fair and he’d respond, “life isn’t fair.” He’d infuriate me, and then he’d say: “No, you allow yourself to become angry,” (which only upset me more). It wasn’t until I left our home at 18 that I realized he was right, and I was a punk-kid. Dad was a pretty smart guy after all. He was a stealth Joe Torre. In short, the Yankees have a long history of winning because they believe at their core that they are winners, and that belief builds that kind of momentum it takes to take a specific thought and make it manifest itself in the physical world. Growing up in Chicago, it was interesting to be a Yankees fan. In the 90’s I was accused of being a band wagon fan, and the whole “the Yankees buy their success” argument was always just moments away. There are countless responses to that, but one that always shut them up was that the Cubs didn’t shell out any cash or do what they needed to do to win because they could put an entire field of losers on the field and Wrigley Field would sell out. The Cubs have historically expected to lose. People call them “Loveable Losers.” Who wants to be a “loveable loser”? It’s an insult. When the baseball world pats you on the head and tells you to run along home come playoff season because you’re a “lovable loser,” then perhaps it’s time to rethink the clubhouse culture. So now you’re asking how this all ties into politics. Time for another story. Diagnosis: Grandiosity. Fantasies of success. Manipulation of others. Expectation of admiration. Arrogance. Sense of entitlement. Believes self to be special. Lacks empathy. Envious of others. Treatment: Psychotherapy, focusing on acceptance of shortcomings. The Yankees come off as “arrogant” because they have “fantasies of success.” I — the conservative — come off as “arrogant” because I have “fantasies of success.” Are there really narcissists out there? Of course. But often times perpetual losers label successful people as “arrogant” or “lacking empathy” because it’s an easy way of ending any honest evaluation of their own shortcomings. Years ago I stopped following the Yankees because I was so disgusted with how George Steinbrenner treated Joe Torre at the end of his run. However, I always respected his commitment to excellence. With his passing, my interest in the team has slowly returned, but Joe Girardi’s ability to create a positive clubhouse atmosphere has accelerated the process. Note: This might be one of the few articles DenverPat disagrees with me! Update: Here’s a little something for all you Cubs fans (strong language). Although I’m in New England, where rooting for the Yankees is a keelhauling offense, my family roots are in Staten Island, NY and as such was raised properly to embrace the pinstripes of the world’s greatest ball team. Girardi, DiMaggio, Torre, Rizzuto — Paisanos all. It’s the Spaghetti League. I won’t even mention the Bambino, an honorary Italiano. In the grand card game that is the game of life (and baseball) , winners tell jokes. There is also no crying in baseball. Nor sniveling (love that word) either. I was hoping a piece on the Yankees would get you to pull out the big guns. Sorry but I have to disagree, go Tigers! Eh. I can’t dislike the Tigers. I’ve always been kind of weird like that. There really aren’t any teams I dislike. In football I don’t like the Ravens. Never have, and Ray Lewis never helped matters. I don’t like the Raiders because Al Davis tried to ruin my favorite player’s career (Marcus Allen). I am also a Lions fan…..that is a tough one to admit. Didn’t know where to put this; RIP Don Zimmer, as fine a coach the Yankees had, and several other teams as coach/manager/player too. And by all accounts, a great guy.